Cinemagraphs trigger strong emotional reactions in viewers, which in turn lead to higher levels of engagement. Don’t believe us? Here’s what everyday people have to say. For years, marketers have been trying to answer the question: what makes you click? So, let’s think about it for a second. When you’re scrolling through clogged social media feeds, or browsing the noisy web, what is it that grabs your attention? Web-weary consumers know every marketing trick in the book, but there is still one key factor that makes people consistently stop in their trackpads: emotion. Whether it’s joy, excitement, amusement, surprise, curiosity, empathy, or even anger, if you want to have an authentic engagement with people online, you need to make them feel something in the real world. But that’s not easy. Consumers are now overstimulated with a constant barrage of content vying for their attention. A lame corporate meme is more likely to incite derision than delight, so as a marketer, you literally cannot afford to rely on old methods. At gallereplay, we believe that cinemagraphs are works of art that can delight even the most jaded webizen. These living photos have been shown to consistently invoke an emotional reaction in viewers, with an especially strong impact on those seeing them for the first time. 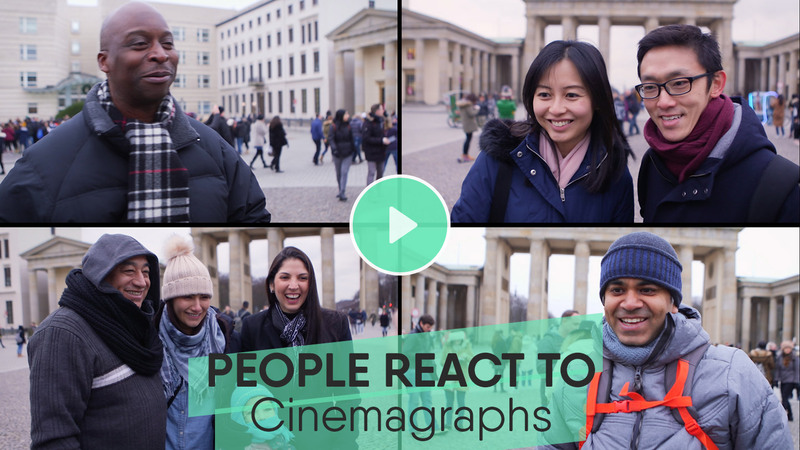 To prove their power, we showed them to people on the streets of Berlin and recorded their reactions. Here are the most common responses. This on-street reaction corresponds to the online experience. In 2016, we created a series of cinemagraphs for Factory, a Berlin-based innovation space, to illustrate their company values. After launching their “Ten Concrete Commandments”, session times on their website doubled. On websites generally, an average session time of two minutes is considered to be a pretty good benchmark. On gallereplay.com, it’s consistently around four minutes. This reaction rings true when compared with web engagement. According to a piece in the Wall Street Journal, a viewer is 60% – 80% more likely to click a cinemagraph than a regular photo, which is very good news in terms of the CTR of your banner and display ads. Clients of ours have also reported 4x higher conversions from display ads featuring cinemagraphs, compared to those using static images. Novelty is key to the virality and shareability of web content. If you can spark excitement or intrigue in someone, they’re going to want to show their friends. One couple we spoke to were very enthusiastic: “It’s kinda crazy because it’s still but it’s moving at the same time. It’s alive! It jumps at you from the page. A definite ‘like’ on Instagram. 100%.” Another viewer agreed, saying, “It’s definitely grabbing. You’re going to think about it a little bit, there’s no doubt.” Cinemagraphs are a massively versatile way to engage your users, or to capture new potential customers. Not only will you experience an increase in CTR and in website dwell time, but your social media posts will show a much stronger performance than a static image or text content could provide. Social Media Today asserts that moving image posts have 135% greater organic reach on Facebook than static image posts, and that appetite is just growing. TechCrunch reported that 100 million hours of moving image content is consumed everyday on Facebook. Cinemagraphs are beautiful living photos that tug at a very essential, emotional part of the human experience. Appealing to people aesthetically shows a certain understanding of their personality, and of the persona they wish to project. That connection is crucial for anyone trying to trigger engagement with their business online as well as off-. But don’t take it from us. Take it from them. Want to post cinemagraphs from our collection on social media? Check out our step-by-step guide for posting cinemagraphs to Facebook, Instagram and Twitter.